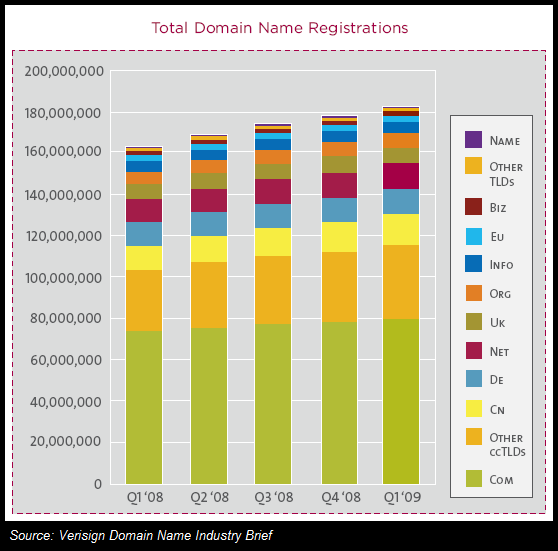 Verisign publishes a quarterly report about the domain name industry called The Domain Name Industry Brief. The latest report, summing up Q1 2009, was just released. Since there is always a lot of data in these reports to mull through, we decided to pick out what we think are some of the more interesting facts and figures and sum them up in this article. These are a few highlights from the Verisign report that we thought were worth highlighting. At the end of Q1 2009 there were nearly 183 million registered domain names across all TLDs. The total number of domain names across all TLDs grew by 12% compared to the same time last year. ccTLDs (country-code TLDs) account for 74.1 million of those domain names. The number of ccTLD domain names grew by 18% compared to the same time last year. Included in the report is also this chart that shows the number of domain names across all TLDs, quarter by quarter. Note the dominance of .com. It’s still by far the most popular TLD. An interesting side note worth mentioning is that Verisign also includes information about the load on its DNS infrastructure in these reports. Since Verisign is the domain registry that manages the .com and .net TLDs it has its work cut out for it. Verisign’s DNS servers handled an average of 38 billion queries per day in Q1 2009, up from 35 billion for the same period last year. Which are the most popular TLDs? Look no further. That was also included in the report. And here’s another interesting factoid from the report: There are 240+ ccTLD extensions, but the top 10 account for 64% of the registrations. There is plenty of more information (and charts) to be found in the full report from Verisign (PDF) if you like this kind of stuff. Looks like domain name registrations won’t be slowing down anytime soon, just like the overall growth of the Web keeps charging ahead. Something very interesting pops out at me in these numbers. In light of European unification efforts, and the already widespread adoption of the Euro and attempts to lower continental trade barriers, it is surprising that “Other ccTLD’s” are so outpacing .eu domains in registrations. I know this group includes non-European countries, and some southern European countries have difficulty gaining entry due to fiscal constraints on adoption of the Euro as a currency, but still you have all of central Europe (a huge population by itself) plus most of northern Europe included in the union. Over time, I would not be surprised if the .eu domains began to take up a bigger share of new registrations. Is Microsoft’s Bing a raving success in Australia?